Zenobia’s leader’s daughter, Yuria honestly thought thinks that. If it’s this person then it’s fine to become a bride, it’s fine to offer her chastity, it’s the first time she’s met a person she’s thought of as such. Is this what’s called first love? Until now Yuria has not known love. Her father raising talks of marriage, she had met with many men, but until now she had never felt even once this kind of throbbing. It was the same with the son of a wealthy merchant of the neighboring country that she had headed for the other day. Merely boasting of the fortune his father had built up, the person himself had no resourcefulness. Simply using his father’s power as a shield, no more than a domineering, boring man. This entry was posted in The Maou Army's Strongest Magician was a Human, Uncategorized and tagged ユリアの想い　††, The Maou Army's Strongest Magician was a Human, V2C20, Yuria's Thoughts　†† on March 14, 2019 by Xiose. When I call for Sati who’s hidden in the thicket, as recommended by Yuria, I decided to get on the carriage. Rattling and swaying, but even so it’s still more comfortable than a horse. Sati curiously looks over the inside of the carriage curiously. The girl I saved just before asks with great interest. I spoke to her that we should stick to the fact that I’m a magician from Isthmus, but the girl named Sati is an honest person at heart. There’s not many girls who are as bad at lying as her. Sati tries to gloss over it somehow, but I interrupt her. When I explain like that, Yuria seems to understand. While a bit shy, Yuria explains the situation. Tentatively, I said it as lip service, but I think it’s certainly a waste. Since the girl named Yuria・Octave, even without flattery she’s a beautiful girl. In addition, she’s the daughter of the Commerce Alliance’s leader. If you were joined in marriage with her, you won’t be troubled for money in life afterwards. As I thought so, Yuria asks me in a tone like a mischievous girl. When she hears those words, she smiles even more. This girl, she seems graceful, but she’s quite an unruly girl. I hold such an impression, but that unruly girl surprises me even more. As she states so, she merrily smiles. No way, I think, but for the moment I nod. I could only answer with silence. It seems Sati is also dumbfounded. Well of course, since she’s making an offer of marriage to someone whose origins are unknown that she met just now. It’s normal to doubt this girl’s commonsense. I was involuntarily silent, but her eyes were serious. I didn’t come searching for a bride. I came for the purpose of meeting with Zenobia’s leader, and tying a treaty. However, for that reason, I can’t simply shake my head and refuse. Hurting her feelings here isn’t a good plan. I decided to conduct myself like a Japanese person. In short, I decided to be evasive. When she hears those words, she seems to agree. However, her delusions continue to the ends of the world. The journey until Zenobia, talks of the honeymoon, a new home, on top of that, even the number of children, she spoke endlessly. Replacing her one sided plan for BGM Sati and I headed towards Zenobia. This entry was posted in The Maou Army's Strongest Magician was a Human, Uncategorized and tagged A Sudden Marriage Proposal, 突然の求婚, The Maou Army's Strongest Magician was a Human, V2C19 on March 12, 2019 by Xiose. Sorry about the late update, got busy and then had to travel. The Kickstarter was funded! Unfortunately, it didn’t reach the stretch goals. However, I wanted to thank everyone who backed or spread the word. It really came down to the wire, seriously it went over by only $359 after going up and down at the last couple seconds. Anyways, thanks to anyone who helped out! When I approach on my horse, the battle had already begun. At first I thought that the caravan group with fewer numbers had a disadvantage, but they were surprisingly putting up a good fight. It seems there were magicians and magic swordsmen among the caravan’s guards. I think for a moment, but while I was thinking like that one of the vanguard’s soldiers was struck directly by the bandit’s axe and collapsed. ––––as expected it seems there’s a need to cover them. I begin chanting the usual 《Impact》 magic. This entry was posted in The Maou Army's Strongest Magician was a Human, Uncategorized and tagged The Maou Army's Strongest Magician was a Human, Unexpected Aid, V2C18, 思わぬ人助け on March 9, 2019 by Xiose. A litle late, sorry about that~ Overslept. 15 hours to go in the Kickstarter, it’s not going to make the stretch goals but if you can spread the word. I’ve seen some people say they weren’t aware of the Kickstarter until just recently. The Commerce Alliance refers to several cities in the south on this continent. There are no large countries in the south of this continent, each city has autonomy and they each govern uniquely. In the middle of heading to Zenobia, Sati asks me. Sati seems to have received a shock. For many years she was a slave of an aristocrat in the city of Arsenum. This entry was posted in The Maou Army's Strongest Magician was a Human, Uncategorized and tagged ゼノビアへの道中, En Route to Zenobia, The Maou Army's Strongest Magician was a Human, V2C17 on March 5, 2019 by Xiose. 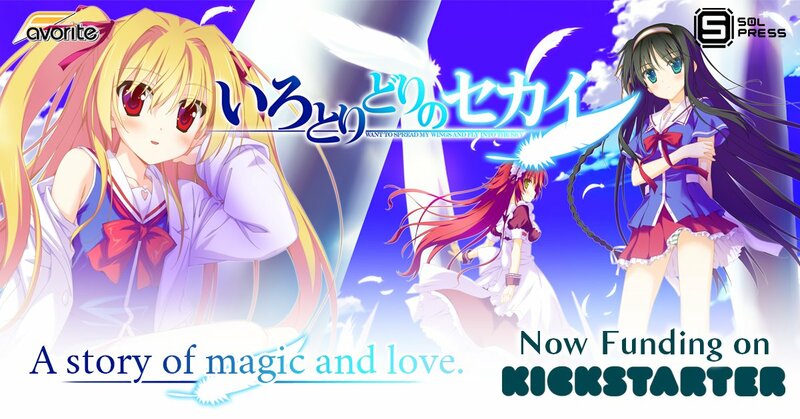 I would also like remind everyone about the Irotoridori no Sekai Kickstarter, it’s close to 50K so if everyone that reads this novel tells 10 people and they pledge around 10 dollars it’ll clear all the stretch goals! Details about daily updates and stuff on the side bar. That’s the first thing Lilith says when I explain the situation. Next, “I’ll go too” and tries to start getting ready for the trip, but I stop her. This entry was posted in The Maou Army's Strongest Magician was a Human, Uncategorized and tagged 部下への言づて, Message to Subordinates, The Maou Army's Strongest Magician was a Human, V2C16 on February 28, 2019 by Xiose.